I have had a love affair with journaling since I was a kid. For whatever reason, I have always enjoyed introducing written words to blank pages. When I was a kid I used to take scraps of paper and make my own little journals, folded and saddle-stitched with safety pins. I used these homemade journals to chronicle my scouting adventures — fishing, camping, hiking, gear notes, and more. Later, I started using spiral notebooks to record thoughts, poems, and miscellaneous ramblings. When I started traveling, one of the things I enjoyed most was finding just the right journal to chronicle my adventures on each of my trips. 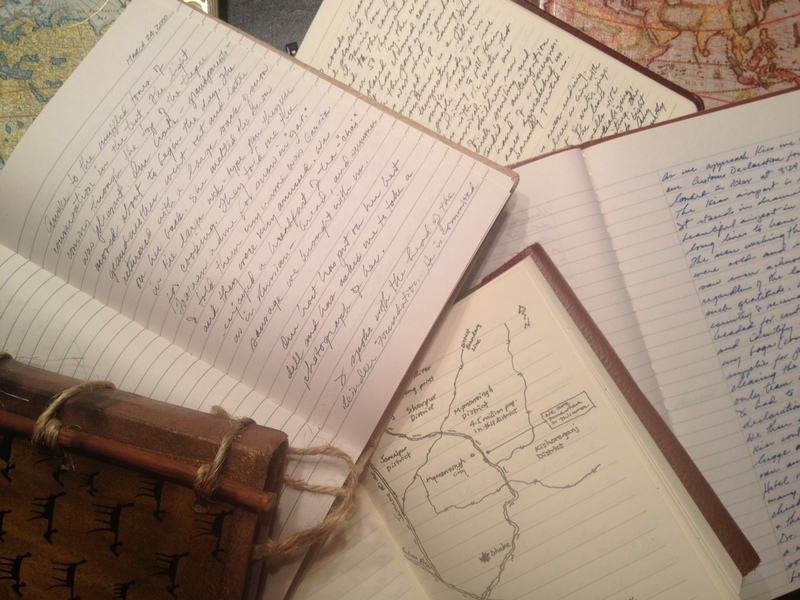 I filled lots of these journals with handwritten notes and drawings recorded on the field in many countries. I still enjoy perusing through those old journals. Doing so reminds me of how easy it is to forget so many of the interesting things that have happened along the way. Someday I hope to take each of these journals and copy my notes into digital files. My journaling journey took an unexpected turn when I discovered the wonderful world of blogging. At first, I continued to blog and to keep a handwritten journal and soon transitioned to only blogging. One thing I like about blogging is being able to make posts available instantly online for a wider audience than just myself. An added benefit of blogging is interacting with readers via comments and email exchanges. And, I have enjoyed watching my blog readership steadily grow from month to month. I am especially encouraged that during the month of July more than 10,500 guests (as of this writing) visited my blog — a new record. Blogging holds me accountable for thinking deeply and challenges me to glean a lesson or two from the things that happen daily along my journey as a Christ-follower. And, it continues to scratch my itch of wanting to marry written words with blank pages, or rather a blank screen. I appreciate each of you who visit my blog on a regular basis and who encourage me with your comments and emails. I will continue to try to honor your trust by posting what I learn on my journey in ways that are interesting and engaging. Thanks for being a part of my journaling journey. I think I can speak for most when I say reading your blog makes us feel like we’ve made the journey with you. I always feel encouraged after reading and like a good book, looking forward to the next. Thanks for your kind words and faithful readership, Kim. Thanks for sharing about your writing journey. Journaling can be very therapeutic. Glad to know that you continue to write your thoughts in both a journal and a blog. Keep it up. Thanks so much, Pearl. I appreciate your readership. I have had the privilege of traveling with you and reading your blog at the end of our day. In doing so I recognized your gift for searching out the deeper lessons available in daily life. How was it that I stood next to you that day, but our experiences were so different? It is because you have learned to search for what God has to teach in every encounter, and the gift to communicate those lessons through writing. I have been inspired by you to look at life with a lens more sharply focused on God. Thanks for your very kind words, Kevin. A big part of my daily adventure is the anticipation of seeing something new or in a new way and then writing about it. It keeps life interesting. So glad that we have had the opportunity to travel together. Your enthusiasm for serving God is inspiring. Thank you Omar for inspiring us with your gift of words! Thank you, Celia. I appreciate your faithful readership and always-encouraging comments.